This workshop will focus on the keys to understanding and developing a richer spiritual life as we face the trials and tribulations that come in our everyday lives. In many ways the trans community is left behind and forgotten and sometimes hated on even within the black LGBT community. This has been an issue that many trans women of color face. Society disrespects, discriminates against and misunderstands trans women. Unfortunately, this subconsciously happens within our own community. The trans community is far behind the gay and lesbian community as it relates to having their concerns heard and addressed by society. Sometimes they feel like they do not have support from the rest of the LGBT community to accept them and help fight for the rights of trans women. A panel of trans women will provide a better understanding of how they feel and suggest ways to ensure progress. In many ways the trans community is left behind and forgotten and sometimes hated on even within the black LGBT community. This has been an issue that many trans women of color face. Society already gives trans women many forms of disrespect, discrimination, and misunderstanding and unfortunately and subconsciously happens within our own community. The trans community is far behind the gay and lesbian community as it relates to having their concerns heard and addressed by society and sometimes they feel like their isn't support from the rest of the LGBT community to accept them and help fight for the rights of trans women. A panel of trans women will speak to give a better understanding of how they feel and give ways to make it better. Women in the Life Association (WITLA) is back after a hiatus to provide a safe space during DC Black Pride. This workshop will provide an opportunity to have an intimate intergeneration discussion to increase understanding of each other’s perspectives. Activists in their 20s, 30s, 40s, 50s and 60s will break down walls that divide us. This workshop examines the root causes of homophobia in the Black Church and explores the ways to overcome the hurt and pain that remains for Black LGBT Christians. The Masculine of Center Conference Group will hold a panel discussion on the issues, concerns and life stories of Masculine of Center (MOC) individuals in the LGBT community. The discussion will focus on who they are, what they are about, what drives them, and how our community can do better in the areas of advocacy, outreach and establishing initiatives for the MOC community. Come and interact with advocates, educators, policy makers, entertainers, and community leaders as they let their MOC voice be heard. This panel is a preview of the Masculine of Center Conference being held July 28-30 in the Tysons Corner, Va. For more information visit mocconference.com. Members of the LGBT community have found love and acceptance romantically, but the trans community struggles with genuine relationships because of the fears of the trans attracted men being open. In society as a whole and even within the LGBT community, there is a stigma against men that are attracted to trans women. There is a misunderstanding of who they are, what they want and where they fit into society and the LGBT community. Trans attracted men will discuss these topics to give individuals a better understanding of their perspective. There is nothing new about it. Getting Full. The Pregame. Getting Full. Party and Play. And let’s not forget Sliding into your DMs. There are some who believe its getting out of hand. While others don’t see the cause in alarm at all. What’s really going on? Let’s chat about it. Presenter: Beta Phi Omega Sorority, Inc. Beta Phi Omega Sorority, Inc. has partnered with several LGBTQ Greek and Panhellenic organizations to discuss the needs of members of the LGBTQ community interested in Greek Life. 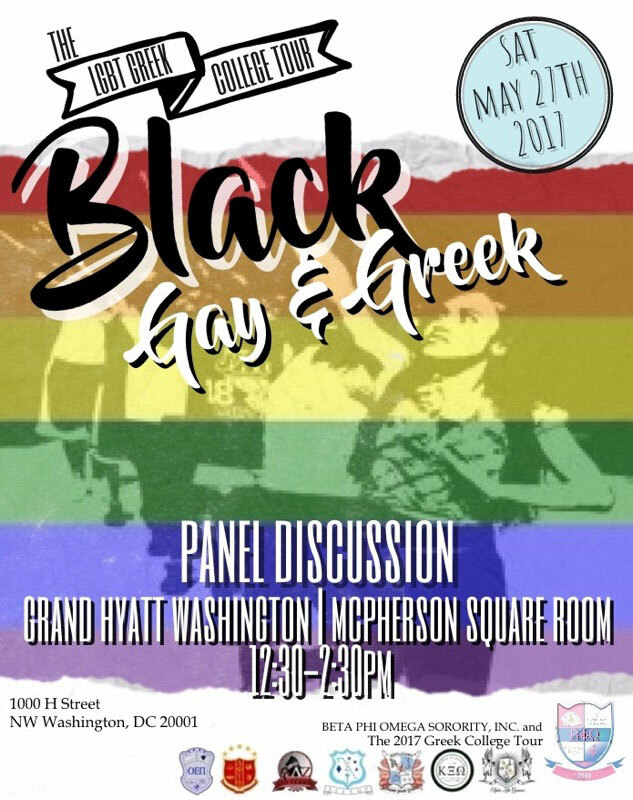 The purpose of the Black, Gay and Greek panel discussion is to provide awareness and education regarding the LGBTQ African-American Greek life experience. We will educate some and encourage others to move past the stereotypes and into their own true authentic experience. The LGBTQ Greek College Tour has previously engaged with LGBTQ students of color in their college environment for the purpose of providing awareness and information on college campuses throughout the Washington, DC and Maryland areas.